Celebration is the third greatest hits album by American singer and songwriter Madonna, and the final release under her contract with Warner Bros. Records, her record company since 1982. The release follows her two previous greatest hits albums, The Immaculate Collection (1990) and GHV2 (2001). The compilation was released in many different formats including a one-disc edition and a deluxe double disc. A compilation DVD, entitled Celebration: The Video Collection, was released to accompany the audio versions. The album includes three new songs, the title track which is included on all versions, "Revolver" which is included on the deluxe editions, and "It's So Cool" which is included as a bonus track on some of the iTunes Store deluxe digital versions. A fourth song, "Broken", was recorded for the album but not used; eventually it was released in 2012 as a limited edition promotional vinyl single for fanclub members. Celebration was appreciated by contemporary critics, who noted the vastness of Madonna's back-catalogue. The album debuted at the top of the charts in Belgium, Canada, Ireland, Italy, Mexico and the United Kingdom. Madonna became tied with Elvis Presley as the solo artist with the most number-one albums in the United Kingdom. In the United States, it debuted at number seven in the Billboard 200; in other nations, it also debuted within the top ten, peaking in the top three in most of them. The title track was released as the first single of the album. It became Madonna's 40th number-one song on Billboard's Hot Dance Club Songs chart. "Revolver" was released as the second single from the album in some territories, but did not achieve significant commercial success. An art gallery inspired by Madonna's image from the cover of Celebration. The song comes first. And all of those other things that people remember, the imagistic things, are secondary, or certainly not as important. But I think I’ve become pretty good at sussing out when people's opinions of my work are coming from what they think of me personally. You just have to do your thing and then let it go out into the world. The rest, you're not in control. On July 22, 2009, Warner Bros. Records officially announced the release date as September 28, 2009 and confirmed the name of the album as Celebration through Madonna's official website. The compilation was available in a case of two, as well as a single CD. The songs on the album were re-mastered and chosen by Madonna and her fans, while covering the whole expanse of her career. A DVD titled Celebration: The Video Collection was released which included several music videos of Madonna that have never appeared on a DVD before. It includes the completed video of the single "Celebration". The cover for Celebration was created by street pop artist Mr. Brainwash who is best known for "throwing modern cultural icons into a blender and turning it up to eleven". Celebration was made available for pre-order on iTunes Store on September 1, 2009, to coincide with the music video release of "Celebration". The standard (1 disc) and deluxe editions (2 discs) are available, as well as an iTunes exclusive Premium Edition which includes each track available on the 2-Disc Edition, as well as a new track entitled "It's So Cool", and thirty MP4 music videos. Celebration received a score of 84/100 at Metacritic, indicating "universal acclaim" from music critics. Sarah Crompton from The Daily Telegraph gave the collection four out of five stars and said: "Madonna's Celebration shows just how consistently she delivers the goods, with tracks such as 'Music', 'Ray of Light', 'Frozen' and 'Don't Tell Me'", with "only a couple of [songs] which feel dispensable." Eric Henderson of Slant Magazine gave the compilation four out of five stars and commented that "functionally, what Madonna and fans are really celebrating with the release of Celebration is the hard proof that Madonna's back catalogue is now so immense and so varied that she can release a behemoth, two-disc greatest hits package that shoehorns in 36 songs and still manages to significantly short-change the singer's legacy", though also noticing that "the album is missing songs, doesn't always include the right ones, [and] seems to have been sequenced by a not particularly intuitive Genius playlist." Tim Sendra from AllMusic praised that "the collection does a fine job of living up to the title — it's certainly a celebration of Madonna's career and includes some of the most celebratory and thrilling pop music ever created." While reviewing the double-disc deluxe edition version of the album, he commented: "The 34-track double-disc Deluxe Edition has an easier time of it than the single-disc 18-track release does." Rob Sheffield from Rolling Stone noted that "Celebration kicks off with pure bliss and never lets up. It's a dizzying, nonchronological spin through the Madonna years, years it makes you feel lucky to be living through. Her hitmaking genius is unmatched and [...] undiminished." However, Sheffield called the omission of "Angel" "just plain crazypants." Lean Greenblatt from Entertainment Weekly commented that the album "holds up surprisingly well". Joey Guerra from Houston Chronicle praised the album saying "every song on Celebration defines a moment in time, a radio sing-along, a twirl under the glitterball. It's a pulsing testament to Madonna's often-overlooked pop prowess, from the scrappy electro beginnings of 'Everybody' and 'Burning Up' to the retro-disco swirl of 'Beautiful Stranger' and 'Hung Up', still a hands-in-the-air highlight." Alan Woodhouse from NME was unfavorable in his review about the compilation, reckoning Madonna's career as two distinct phases, them being her "80s output" and her later career, or "phaze two", summarizing by saying that "Madonna clearly thinks this collection represents a celebration of her longevity [...] in reality all it does it expose her more recent failings", though Woodhouse also called it "unfair to say Madge hasn’t touched magic since 1990" before naming "Hung Up" and "Ray of Light". Douglas Wolk, from Pitchfork, reviewed the album in the same light, also comparing her early work with the later days, stating that "'Hung Up' is really the only song from the post-GHV2 period that's lodged in the American pop consciousness", concluding with saying that "[Madonna] deserves a retrospective more interesting than this haphazard piece of contract-filling product. ", though being positive about the opening sequence, calling that "incredibly strong, a convincing argument for her genius." Madonna closed The MDNA Tour (2012) with an energetic performance of "Celebration". In the United States, Celebration debuted at number seven, with 72,000 copies sold in its first week. It was present on the chart for a total of 12 weeks and was certified gold by the Recording Industry Association of America (RIAA) on November 23, 2009, indicating shipment of 500,000 units. In April 2010, the album got a boost in sales from the Glee episode titled The Power of Madonna. The album re-entered the Billboard 200 at position 85 with sales of 6,000 and a 219% gain. In February 2012 after her appearance on the Super Bowl XLVI halftime show, the album again entered the Billboard 200 at number 24 with sales of 16,000 copies and a 1,341% gain from previous week. In Canada, the album debuted at the top of the Canadian Albums Chart, with sales of 17,000 copies. In Australia and New Zealand, Celebration debuted at numbers eight and two on the official charts, respectively. It was certified gold in both Australia and New Zealand, by the Australian Recording Industry Association (ARIA) and Recording Industry Association of New Zealand (RIANZ), indicating shipements of 35,000 and 7,500 copies respectively. The album also debuted at number one position on the Gfk Chart-Track albums chart in Ireland, earning a platinum certification from the Irish Recorded Music Association (IRMA) for shipment of 15,000 copies of the album. In Japan, Celebration reached a peak of number three on the Oricon albums chart and was placed at number 47 on the Oricon year end rankings, selling 177,194 copies, and earning a gold certification. In terms of units, it is estimated that Celebration has sold about four million copies worldwide. In the United Kingdom, Celebration debuted at number one, selling 77,000 copies in the first week. It became Madonna's eleventh number-one release on the UK Albums Chart, tying her with Elvis Presley as the solo act with the most number-one albums in the British chart history. According to the Official Charts Company, Celebration has sold 370,231 copies in the United Kingdom as of February 2013. From 2009 to 2012, the album had three separate chart runs within the top 100 of the albums chart. It re-entered the chart again on March 1, 2015, at number 38 with sales of 2,476 copies, following the release of her single "Living for Love" from 13th studio album, Rebel Heart. The album was certified double platinum by the British Phonographic Industry (BPI) for shipment of 600,000 copies across the United Kingdom. The album reached the top of the charts in Belgium (Flanders), Denmark, Germany and Italy, while in Austria, Belgium (Wallonia), Finland, Netherlands, Norway, Portugal, Spain, Sweden and Switzerland the album debuted within the top ten of the official charts. In France the album received a platinum certification from Syndicat National de l'Édition Phonographique (SNEP) for shipment of 100,000 copies. It also debuted at number one on Billboard's European Top 100 Albums chart, topping the chart for four consecutive weeks. Celebration was certified double platinum by Federazione Industria Musicale Italiana (FIMI) for shipments of 120,000 copies. In total, Celebration sold over a million copies across Europe, earning a platinum certification from the International Federation of the Phonographic Industry (IFPI). During The MDNA Tour, "Revolver" was performed as the second song of the show. "Celebration" was the first single from the compilation. A first preview of the song was added on the performance for "Holiday" on her 2009 leg of the Sticky & Sweet Tour. It was to be released to radio stations on August 3, 2009. However, the single leaked on to the internet, so the date was changed to July 31, 2009. The digital download was also released on this date due to the leak. Remixes of the song were released to dance clubs on July 24, 2009. "Celebration" received mixed reviews from contemporary critics. The song reached the top of the charts in countries like Finland, Italy and Sweden, while reaching the top-ten in other European nations. It became Madonna's fifty-fifth entry to the Billboard Hot 100 and her fortieth number-one song on the Billboard Hot Dance Club Songs chart. On December 11, 2009 it was confirmed by Madonna's official website that "Revolver" would be released as the second and final single off the album in some territories. The digital maxi single was released in many countries on December 29, 2009, followed by a CD maxi single in the US in late January 2010 and a 12" vinyl single in early February 2010. Contemporary critics gave a mixed review of the song. Some praised the chorus line "My love's a revolver" while others felt that it was underwhelming and not on par with Madonna's previous songs. "Revolver" has charted in the lower regions of the official charts of Belgium, Canada, Finland and the United Kingdom while reaching number four on the Billboard Hot Dance Club Songs chart of United States. This was Madonna's last single of the 2000s. The track, "It's So Cool", debuted on the official charts of Finland, Italy and Sweden at numbers 8, 20 and 30 respectively, due to digital downloads. "Broken", the fourth song recorded for the album but not used, was written and produced by Madonna and Oakenfold, with additional writing from Ian Green and Ciaran Gribbin. "Broken" was given to Madonna's fanclub Icon's official members as a free 12" vinyl, as a part of their membership in late 2012. 12. "Express Yourself (Video Version)"
Digital Deluxe – 37 tracks edition with bonus remix of "Celebration"
iTunes Store Deluxe edition – 38 tracks edition including a bonus track remix of "Celebration" and "It's So Cool"
Amazon Deluxe edition – 38 tracks edition with two bonus remixes of "Celebration"
^ Baker, K. C. (March 17, 2009). "Madonna's Greatest Hits Album to Include New Songs". People. Retrieved March 23, 2009. ^ a b c Kreps, Daniel (September 1, 2009). "Madonna Shows Off Sharp Dance Moves in "Celebration" Video". Rolling Stone. Retrieved January 10, 2013. ^ Caulfield, Keith (March 18, 2009). "Madonna Plans New Tracks For Hits Collection". Billboard. Retrieved July 10, 2009. ^ Reporter, Contactmusic (May 28, 2009). "Paul Oakenfold Discuss His Upcoming "Sticky & Sweet" DJ Sets". Contactmusic.com. Retrieved July 10, 2009. ^ "World Exclusive Madonna News: New Track Names". Attitude. Trojan Publishing Ltd. May 26, 2009. Archived from the original on May 30, 2009. Retrieved July 10, 2009. ^ a b c "'Celebration' - Track Listing for CD & DVD Officially Announced'". Madonna.com. August 26, 2009. Retrieved August 26, 2009. ^ Calms, Dan (September 20, 2009). "Madonna: a rare and candid interview with the Queen of Pop". The Times. Retrieved October 5, 2010. ^ a b c d e f g h i "A "Celebration" Of Madonna Music — The Ultimate Greatest Hits Collection September 28th Release". Madonna.com. July 22, 2009. Retrieved July 23, 2009. ^ a b "Madonna: Celebration". Metacritic. CBS Interactive. Retrieved March 21, 2012. ^ a b Sendra, Tim (September 28, 2009). "Celebration – Review". Allmusic. Rovi Corporation. Retrieved September 28, 2009. ^ Levine, Nick (September 21, 2009). "Madonna: 'Celebration'". Digital Spy. Retrieved November 9, 2011. ^ a b Greenblatt, Leah (September 23, 2009). "Material Goddess Madonna". Entertainment Weekly. Retrieved October 1, 2009. ^ a b Guerra, Joey (September 28, 2009). "Madonna's Celebration is impressive". Houston Chronicle. Retrieved October 12, 2009. ^ a b Woodhouse, Alan (September 28, 2009). "Why Madonna's New Greatest Hits Is No Cause For 'Celebration'". NME. Retrieved October 12, 2009. ^ a b Wolk, Douglas (October 19, 2009). "Album Reviews: Madonna: Celebration". Pitchfork. Retrieved November 27, 2009. ^ Sheffield, Rob (September 28, 2009). "Celebration: Madonna: CD review". Rolling Stone. Retrieved September 29, 2009. ^ a b Henderson, Eric (September 23, 2009). "Madonna: Celebration, CD review". Slant Magazine. Archived from the original on September 28, 2009. Retrieved September 23, 2009. ^ a b Crompton, Sarah (September 16, 2009). "Madonna: Celebration, CD review". The Daily Telegraph. Telegraph Media Ltd. Retrieved September 17, 2009. ^ Sendra, Tim (September 27, 2009). "Celebration [DVD] Overview". Allmusic. Rovi Corporation. Retrieved September 29, 2009. ^ Newman, Jason (May 31, 2012). "Madonna Disses Lady Gaga, Preaches Peace in MDNA Tour Kickoff". Fuse TV. Madison Square Garden, Inc. Archived from the original on June 4, 2012. Retrieved May 31, 2012. ^ Caulfield, Keith (October 7, 2009). "Barbra Streisand Surprises With Ninth No. 1 On Billboard 200". Billboard. Retrieved October 7, 2009. ^ a b "Madonna Chart History (Billboard 200)". Billboard. Retrieved November 9, 2014. ^ a b "American album certifications – Madonna – Celebration". Recording Industry Association of America. Retrieved November 8, 2014. If necessary, click Advanced, then click Format, then select Album, then click SEARCH. ^ Pietrolungo, Silvio (April 29, 2010). "Madonna's 'Glee'tastic 'Celebration' Continues on Hot 100, Digital Chart". Billboard. Retrieved April 29, 2010. ^ Caulfield, Keith (February 8, 2012). "Lana Del Rey Debuts at No. 2 on Billboard 200 Albums Chart". Billboard. Retrieved February 28, 2013. ^ Williams, John (October 7, 2009). "Madonna leads big chart debut week". Jam!. Canadian Online Explorer. Retrieved October 9, 2009. ^ a b "Australiancharts.com – Madonna – Celebration". Hung Medien. Retrieved November 9, 2014. ^ a b "Charts.org.nz – Madonna – Celebration". Hung Medien. Retrieved November 9, 2014. ^ a b "ARIA Charts – Accreditations – 2009 Albums". Australian Recording Industry Association. Retrieved November 8, 2014. ^ a b "New Zealand album certifications – Madonna – Celebration". Recorded Music NZ. Retrieved November 8, 2014. ^ a b "GFK Chart-Track Albums: Week 39, 2009". Chart-Track. IRMA. Retrieved November 9, 2014. ^ a b "Irish album certifications – Madonna – Celebration". Irish Recorded Music Association. Retrieved November 8, 2014. ^ a b "Oricon Top 50 Albums: 2009-10-12" (in Japanese). Oricon. Retrieved November 9, 2014. ^ a b "2009 Oricon Annual Ranking" (in Japanese). Oricon. Retrieved October 2, 2014. ^ a b "El reinado de Madonna a través de sus discos" [Madonna's Reign Throughout Her Albums]. Univision (in Spanish). p. 11,19. Archived from the original on August 19, 2010. Retrieved February 6, 2013. ^ Sexton, Paul (September 29, 2009). "Madonna's UK Chart 'Celebration'". Billboard. Retrieved September 29, 2009. ^ a b "Official Albums Chart Top 100". Official Charts Company. Retrieved November 9, 2014. ^ Jones, Alan (March 4, 2010). "London rules the charts". Music Week. Retrieved February 28, 2013. ^ "Search the Official Charts: Celebration" (Click on the button "Chart Facts"). Official Charts Company. Retrieved March 1, 2015. ^ Caulfield, Keith (March 1, 2015). "Madonna Scores Historic 71st Top 40 U.K. Single". Billboard. Retrieved March 1, 2015. ^ Jones, Alan (March 1, 2015). "Sam Smith tops first streaming integrated UK Albums Chart". Music Week. Retrieved March 1, 2015. (Subscription required (help)). ^ a b "British album certifications – Madonna – Celebration". British Phonographic Industry. Retrieved March 27, 2017. Select albums in the Format field. Select Platinum in the Certification field. Type Celebration in the "Search BPI Awards" field and then press Enter. ^ a b "Ultratop.be – Madonna – Celebration" (in Dutch). Hung Medien. Retrieved November 9, 2014. ^ a b "Lescharts.com – Madonna – Celebration". Hung Medien. Retrieved November 9, 2014. ^ a b "French album certifications – Madonna – Celebration" (in French). Syndicat National de l'Édition Phonographique. Retrieved November 8, 2014. ^ a b Sexton, Paul (October 2, 2009). "Madonna's 'Celebration' Tops Euro Chart". Billboard. Retrieved October 2, 2009. ^ a b "Italian album certifications – Madonna – Celebration" (in Italian). Federazione Industria Musicale Italiana. Retrieved November 8, 2014. Select "2010" in the "Anno" drop-down menu. Select "Celebration" in the "Filtra" field. Select "Album e Compilation" under "Sezione". ^ a b "IFPI Platinum Europe Awards – 2009". International Federation of the Phonographic Industry. Retrieved November 8, 2014. ^ William, Dan (June 1, 2012). "Madonna kicks off MDNA tour". Woodstock Sentinel-Review. Ken Koyama. Retrieved July 11, 2012. ^ "'Celebration' single download now". Madonna.com. July 31, 2009. ^ Caulfield, Keith (July 23, 2009). "Madonna's 'Celebration' Hits Collection To Feature Two New Songs". Billboard. Retrieved July 23, 2009. ^ Ben-Yehuda, Ayala; Trust. Gary (August 13, 2009). "Black Eyed Peas, Jason Mraz Tie Records On Billboard Hot 100". Billboard. Retrieved August 14, 2009. ^ Trust, Gary (September 15, 2009). "'Celebration': Madonna's 40 Most Impressive Instants". Billboard. Retrieved September 15, 2009. ^ "'Revolver' Domestic And European Release Dates". Madonna.com. December 11, 2009. Retrieved December 12, 2009. ^ "Madonna vs David Guetta – Revolver". Ultratop. Hung Medien. Retrieved April 22, 2010. ^ "Madonna – It's So Cool (song)". Italiancharts.com. Hung Medien. Retrieved October 2, 2009. ^ "2010 Gift – Here It Is!". Madonna.com. August 28, 2011. Retrieved August 28, 2011. ^ "Celebration by Madonna". Brazil: Encartes Pop. Retrieved December 3, 2018. ^ "Madonna – Celebration". Argentine Albums. CAPIF. On Fecha, select 29/09/2009 to see the correspondent chart. Retrieved November 9, 2014. ^ "Austriancharts.at – Madonna – Celebration" (in German). Hung Medien. Retrieved November 9, 2014. ^ "Ultratop.be – Madonna – Celebration" (in French). Hung Medien. Retrieved November 9, 2014. ^ "Madonna Chart History (Canadian Albums)". Billboard. Retrieved November 9, 2014. ^ "Top Stranih [Top Foreign]" (in Croatian). Top Foreign Albums. Hrvatska diskografska udruga. Retrieved November 9, 2014. ^ "Czech Albums – Top 100". ČNS IFPI. Note: On the chart page, select 200940 on the field besides the word "Zobrazit", and then click over the word to retrieve the correct chart data. Retrieved November 9, 2014. ^ "Danishcharts.dk – Madonna – Celebration". Hung Medien. Retrieved November 9, 2014. ^ "Dutchcharts.nl – Madonna – Celebration" (in Dutch). Hung Medien. Retrieved November 9, 2014. ^ "Madonna: Celebration" (in Finnish). Musiikkituottajat – IFPI Finland. Retrieved November 9, 2014. ^ "Offiziellecharts.de – Madonna – Celebration" (in German). GfK Entertainment Charts. Retrieved November 9, 2014. ^ "Top 40 album DVD és válogatáslemez-lista – 2009. 38. hét" (in Hungarian). MAHASZ. Retrieved November 9, 2014. ^ "Italiancharts.com – Madonna – Celebration". Hung Medien. Retrieved November 9, 2014. ^ "Mexicancharts.com – Madonna – Celebration". Hung Medien. Retrieved November 9, 2014. ^ "Norwegiancharts.com – Madonna – Celebration". Hung Medien. Retrieved November 9, 2014. ^ "Oficjalna lista sprzedaży :: OLiS - Official Retail Sales Chart". OLiS. Polish Society of the Phonographic Industry. Retrieved November 9, 2014. ^ "Portuguesecharts.com – Madonna – Celebration". Hung Medien. Retrieved November 9, 2014. ^ "Чарт продаж. Россия" (in Russian). 2m-online.ru. September 30, 2009. Archived from the original on December 18, 2009. Retrieved September 30, 2009. ^ "Official Scottish Albums Chart Top 100". Official Charts Company. Retrieved June 19, 2015. ^ "Spanishcharts.com – Madonna – Celebration". Hung Medien. Retrieved November 9, 2014. ^ "Swedishcharts.com – Madonna – Celebration". Hung Medien. Retrieved November 9, 2014. ^ "Swisscharts.com – Madonna – Celebration". Hung Medien. Retrieved November 9, 2014. ^ "Madonna Chart History (Top Catalog Albums)". Billboard. Retrieved June 27, 2018. ^ "ARIA Charts – End of Year Charts – Top 100 Albums 2009". Australian Recording Industry Association. Archived from the original on January 28, 2012. Retrieved November 10, 2014. ^ "Rapports Annuale 2009 Alben" (in Dutch). Ultratop 50. Hung Medien. Retrieved November 10, 2014. ^ "Rapports Annuale 2009 Alben" (in French). Ultratop 40. Hung Medien. Retrieved November 10, 2014. ^ "Hitlisten.dk – 2009 Seleben". IFPI Denmark. Archived from the original on September 26, 2010. Retrieved November 10, 2014. ^ "Alben Jaaroverzichten 2009". MegaCharts. Retrieved November 10, 2014. ^ "2009 European Top 100 Albums". Billboard. Retrieved November 10, 2014. ^ "Myydyimmat Lista 2009". Suomen virallinen lista. Retrieved November 10, 2014. ^ "Album Jahrescharts 2009". Media Control Charts. Archived from the original on January 2, 2010. Retrieved November 10, 2014. ^ "Eves Osszesitett Listak Album 2009" (in Hungarian). MAHASZ. Retrieved November 10, 2014. ^ "FIMI Mercato 2009" (in Italian). Federation of the Italian Music Industry. Archived from the original on January 23, 2010. Retrieved November 10, 2014. ^ "Top 100 Musica – Albums" (PDF). Asociación Mexicana de Productores de Fonogramas y Videogramas. 2009. Archived from the original (PDF) on October 21, 2012. Retrieved September 24, 2010. ^ "Hitlistan.se 2009 Year End". Sverigetopplistan. Archived from the original on March 4, 2014. Retrieved November 10, 2014. ^ "Swiss Year-End Charts 2009". Swiss Music Charts. Hung Medien. Archived from the original on November 16, 2014. Retrieved January 6, 2011. ^ "End of Year Album Chart Top 100 - 2009". Official UK Charts Company. Retrieved 8 January 2016. ^ "2010 Year-End European Albums". Billboard. Retrieved December 12, 2010. ^ "Top 100 Album Combined — Classifica annuale (dal 2 Gennaio 2012 al 30 Dicembre 2012)" (PDF) (in Italian). Federation of the Italian Music Industry. Archived from the original (PDF) on January 16, 2013. ^ "Ultratop − Goud en Platina – albums 2009". Ultratop. Hung Medien. Retrieved November 8, 2014. ^ "Brazilian album certifications – Madonna – Celebration" (in Portuguese). Associação Brasileira dos Produtores de Discos. Retrieved November 8, 2014. ^ "Danish album certifications – Madonna – Celebration". IFPI Denmark. Retrieved November 8, 2014. ^ a b "Madonna" (in Finnish). Musiikkituottajat – IFPI Finland. Retrieved November 8, 2014. ^ "Gold-/Platin-Datenbank (Madonna; 'Celebration')" (in German). Bundesverband Musikindustrie. Retrieved November 8, 2014. ^ "Polish album certifications – Madonna – Celebration" (in Polish). Polish Society of the Phonographic Industry. Retrieved November 8, 2014. ^ "Portuguese album certifications – Madonna – Celebration" (in Portuguese). Associação Fonográfica Portuguesa. Retrieved November 8, 2014. ^ "Russian album certifications – Madonna – Celebration" (in Russian). National Federation of Phonogram Producers (NFPF). Retrieved November 8, 2014. ^ "Spanish album certifications – Madonna – Celebration" (PDF) (in Spanish). Productores de Música de España. Retrieved November 8, 2014. Select album under "Chart", enter 2009 in the field "Year". Select the certification week in the field "Semana". Click on "Search Charts". ^ "Guld- och Platinacertifikat − År 2009" (PDF) (in Swedish). IFPI Sweden. Retrieved November 8, 2014. ^ "The Official Swiss Charts and Music Community: Awards (Madonna; 'Celebration')". IFPI Switzerland. Hung Medien. Retrieved November 8, 2014. ^ "IFPI Middle East Awards – 2009". IFPI Middle East. Retrieved November 8, 2014. ^ ""Celebration" Australian Release". Sanity Stores. September 13, 2009. ^ "Italy release of Celebration". Italy: IBS. August 7, 2009. Retrieved September 7, 2009. ^ "Celebration (2 CD) by Madonna". United Kingdom: Amazon.com. Retrieved September 2, 2009. ^ a b "Brazil release date". LiveAriaCultura. Archived from the original on January 10, 2010. Retrieved September 3, 2009. ^ "Finnish release date". Levykauppax.fi. Retrieved September 8, 2009. ^ "United States release date". Amazon.com. Retrieved September 1, 2009. 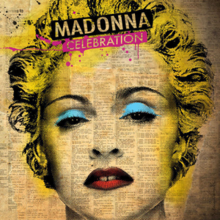 ^ "Celebration (Deluxe Version) by Madonna". Australia: iTunes Store. Retrieved September 4, 2009. ^ "United States - 'Celebration' DVD release". Amazon.com. Retrieved September 9, 2009. ^ "A 'Celebration' of the Queen of Pop" (in Portuguese). ASINCOL. Archived from the original on April 26, 2012. Retrieved October 24, 2010.